AVC All Comers Track Meet! I have never run in a track meet. This may sound like an amazing statement coming from a track coach, but I took up running at the age of 36. Wait, in elementary school, we did have an annual track meet. In 8th grade I ran the 800. We did not even have a track. We did it on our grass field. So I guess my original statement applies. I have not run in a track meet. AVC had an All Comers track meet. That is, it is open to anyone who wants to show up and run. Most of the participants are in high school and college. They are getting in a pre season track warm up, so to speak. But it was worth points in the Grand Prix contest so I went for it. My plan was to do two events: the 1500 and the 3000. 1500 : There were 33 runners who lined up for the race. All of them were youth with the exceptions of Steve Brumwell, Eric Ruble, Oscar Gutierrez, Jeff Smith and myself. As the race began everyone except Jeff took off ahead of me. By about 300m though I did catch one of the young guys. Oscar was not all too far ahead. I remember hearing Alan Brown yell out 85 seconds for my first lap. A lap later I was in the same position, just a little closer to Oscar. 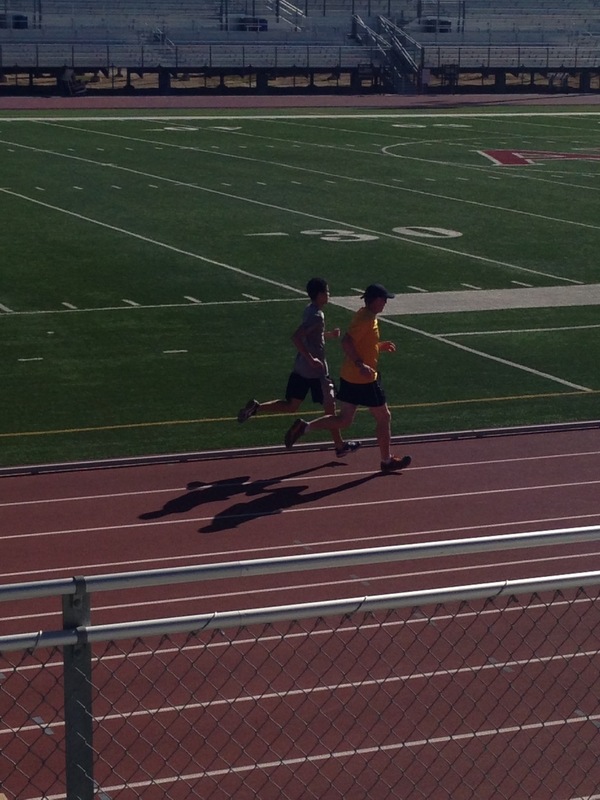 I caught Oscar on the home stretch leading into the bell lap. I ran this as hard as I could worried that Oscar would try to outkick me at the end. The winner of the 1500 was Camden Smith in 4:22.20. His brother Herschel was 3rd in 4:38.48. 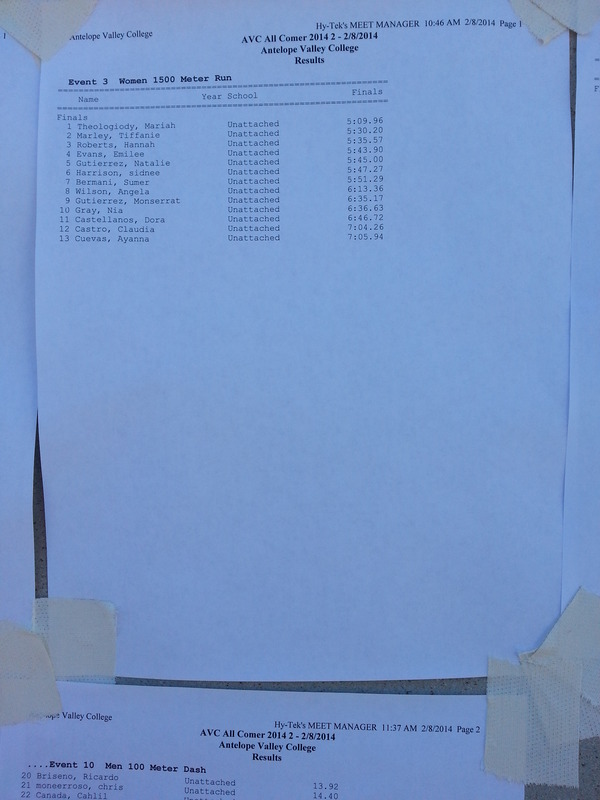 Hillview 8th grader Cade Ruble was 6th in 4:45.05… wow…. 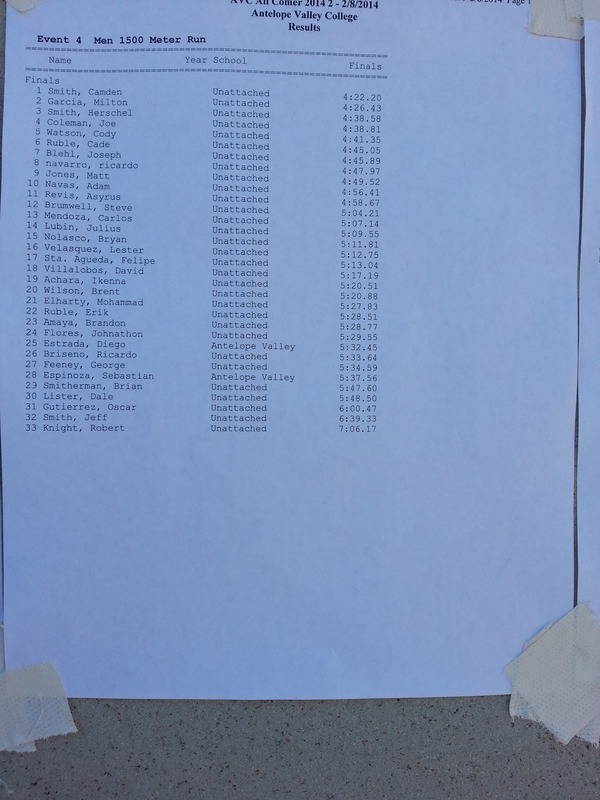 Here are all the guys results. The ladies ran prior to the mens race. A few HDR members: Mariah, Tiffany, Natalie, Dora and Montserrat competed and had a strong showing: Tiffanie led us in a cool down jog of about 2 miles. Then we waited for the 3000. Dora, Natalie and Montserrat ran the 800 but I do not yet have the results. When it came time for the 3000 most of the youth declined. 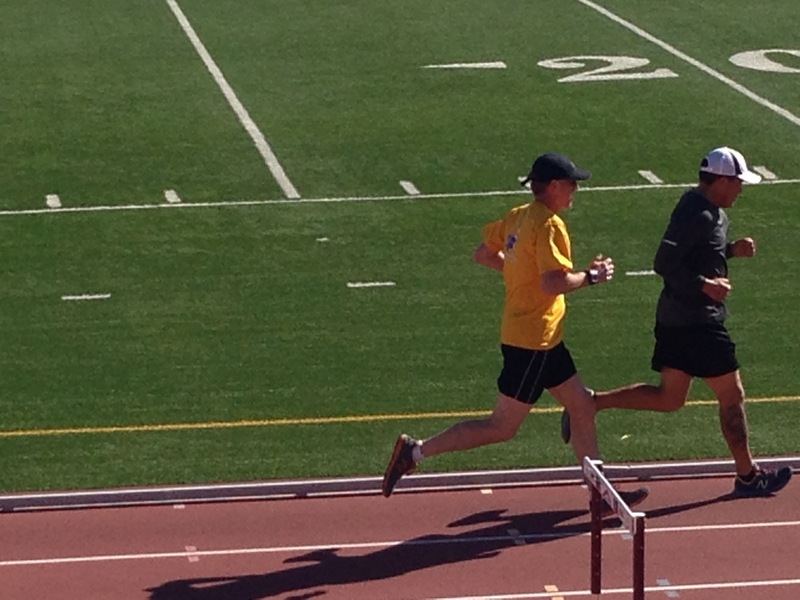 The runners were Joseph Biehl, Eric, Oscar, myself and Karl running with Kristen Parsons (Karl is her coach.) It went pretty much as expected. Joseph ran away with it. Joseph lapped everyone except perhaps Eric. (If he didn’t it was close.) Eric finished 2nd, I was 3rd in 12:21, Oscar was 4th, then Karl and Kristen. I was hoping to run around a 6:25 pace but I was unable to do so. I can blame the wind just a little as it came up and we had to fight it down the homestretch of each lap. As soon as we finished we noticed all the young men lining up in the infield for the 4 x 400 relay. Karl suggested we go for it. Eric jumped right in with the idea. So Oscar and I agreed and they gave us lane 9 1/2. We shared the lane with another team. We did get a few minutes of recovery while they ran the girls relay. Then we were off. Karl went first. He managed to finish somewhere in the middle of the pack. Eric took off next. We were still ahead of 4 or 5 teams as he handed off to Oscar. A few of the guys caught Oscar and he handed off to me a few seconds ahead of the last place team. I went as fast as I could but that last guy caught me with about 150 to go. At 100 I found another gear. I dug really deep and tried my absolute hardest to catch him. I gained and gained. I could hear Eric going wild! I came up just short finishing a stride behind him. I timed my split and came up with 77 seconds! 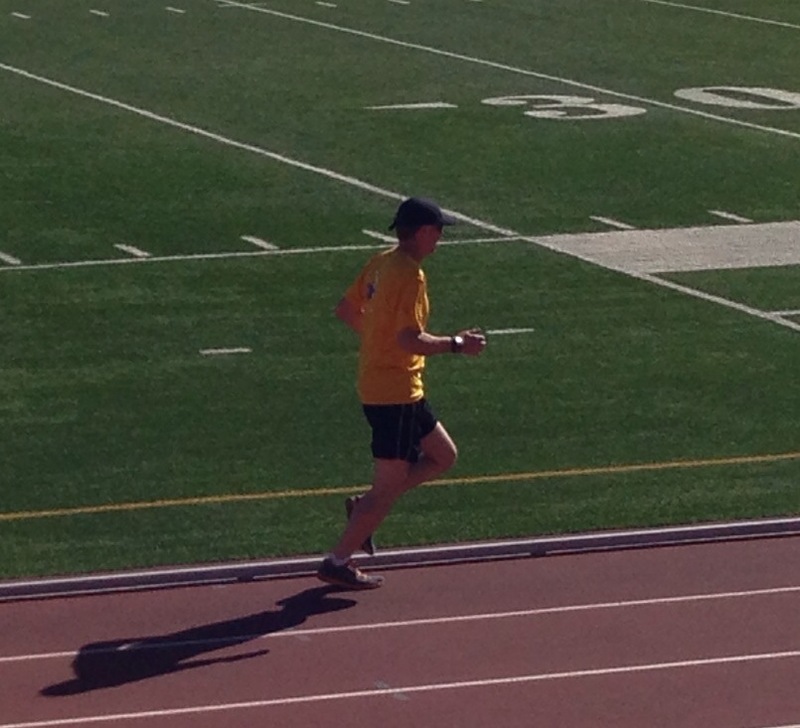 That was by far the fastest lap I have done around a track since I have become a runner. WOW! 77 seconds was your best race. My fastest 400 in the past few years is 80 seconds. You are going to have to push harder on your 400 workouts. No more 88-90 seconds. Shoot for 4-6 in 85 seconds. AND you CAN break a 6 min mile. We will need to set up a mile TT before Carlsbad. 600’s 800’s and some 1200’s will help. Sounds like you got a good workout from all the races. I should have been there instead of doing 6×600. When is our next 2 mile TT? I was planning a 3 x 3000…. or 3 x 2 mile next weekend…. Saturday probably with a long run on Sunday?